Indian Island County Park is a 275-acre park located at the estuarine mouth of the Peconic River. Restrooms and showers are available for campers. The park offers picnic tables, grills, benches, and views of a glistening Flanders Bay. There are 100 tent and trailer campsites. Recreational options include fishing, playgrounds, hiking trails, and a bike hostel. Dogs must be leashed. The Carmans River flows through this park. 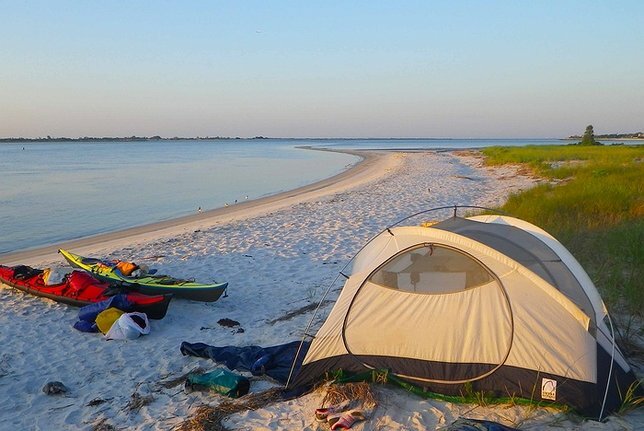 Southaven offers fishing, row boating, horseback riding trails, camping for tents and trailers, and picnic areas accommodating up to 1,000 people total. On the second and fourth Sundays of summer months, attend a Long Island Line Steamers open house and ride around eight acres of tracks on miniature model steam trains. On a peninsula, this campground is in a shady forest and offers lovely views of Gardiners Bay and a long, sandy beach. The latter is the big draw here. Those with a license can hunt for waterfowl in season, or surf cast for bass and bluefish. Canoes can be rented to take out on the lake, and a general store is on site. The historic Cedar Point Lighthouse was on an offshore island when it was built in 1860. Since the hurricane of 1938, there’s been a walkable strip connecting it with the mainland. Blydenburgh is a 600-plus-acre park of forests and meadows that lies along the headwaters of the Nissequogue River. The park has 50 campsites for tents and trailers with shower and dump facilities. There is fishing and rowing on Stump Pond, a historic homestead and water mill to explore; a playground, and an extensive trail system that links up with trails in neighboring Caleb Smith State Park Preserve. Hither Hills has a resort vibe with activities such as movie nights, sand castle contests, arts and crafts, folk and line dancing, magic shows, courts for horseshoes, basketball and volleyball. Campers can enjoy fireplaces and picnic areas, and a large freshwater lake where fishers can drop a line year-round. But the highlight of being at Hither HIlls is being able to sleep right on the two-mile ocean beach. The walking dunes of Napeague Harbor are on the eastern boundary of the park, which also boasts lush Russian olive, oak and pine trees. Battle Row is the perfect spot for first-timers who maybe live in Nassau County and don’t want to drive too far to experience some nature filled R&R. This small, campsite has plenty of woods and lush green space. Restrooms and private showers are available, as well as a playground and a sports field. Nearby the camping ground visitors can also explore Bethpage State Park, Trail View State Park, Museum of American Armor, Old Westbury Gardens, Adventureland and the Sagamore Hill National Historic Site. This family run campsite is the ideal spot for campers with children, since sites are available for tent setups, trailers, motor homes and pop-ups. Visitors can enjoy the swimming pool, camp store, laundry facilities, a playground, WiFi and even a game room. There is also supervised activities for kids and special events for guests, such as Christmas in July and the Maritime Festival in September. Guests are also given access to the town beaches and can enjoy a day in the sun and sand. Subject: LongIsland.com - Your Name sent you Article details of "These Seven Amazing Camping Spots on Long Island Are a Must Visit"